As I mentioned in my gluten-free protein pancake recipe I'm starting to incorporate more protein into my diet in order to aid recovery between my strength training workouts. I've decided to use a natural plant-based protein powder due to the fact that my stomach isn't coping very well with things like beans and some nuts at the moment, which was where I was previously getting my protein from. Adding the powder to things like pancakes and porridge is a super easy way for me to get the nutrients I need and it makes the meals a lot more filling and satisfying too! 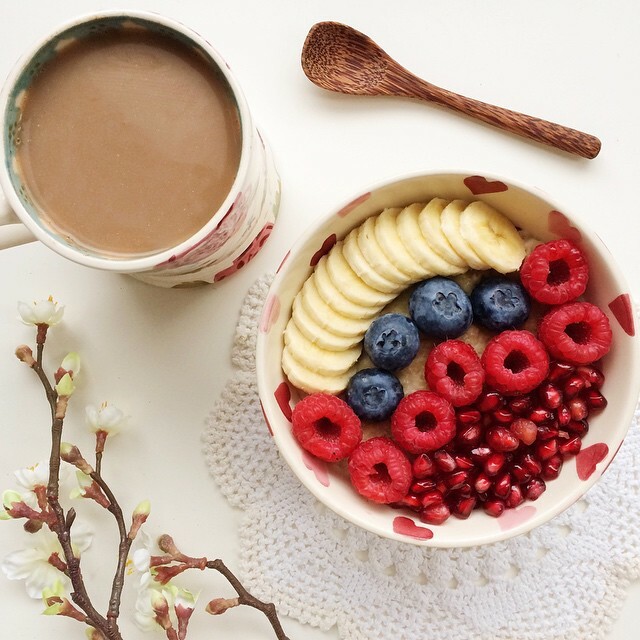 This particular protein porridge recipe uses buckwheat flakes but you can always substitute them for oats, quinoa flakes or rice flakes if you wish. I love adding a tablespoon of cacao powder to mine but feel free to add any superfood powder you like, or none at all if you just want banana flavoured porridge! Put the flakes/oats and liquid into a small saucepan, turn the heat up to the highest setting and bring the liquid to a boil. Once it's boiling reduce the heat to the lowest setting and let it simmer for a minute or two, stirring occasionally, until it has thickened up a bit. Cut the banana in half and mash one half into a pulp. Add this into the porridge and let it cook for another two or three minutess, stirring occasionally, until it's at your desired consistency. When it's ready mix in the protein powder and optional superfood powder then pour it into a bowl, add your toppings (the other half of the banana is always good) and enjoy!